We’re jumping right into our theme for this month: organization and productivity in the kitchen. We’ll visit it here and there throughout April and even welcome a Very Special guest blogger, but that’s all I’m going to say about that surprise for now! You don’t need to be on staff at Martha Stewart Living to have a properly organized kitchen. There are simple actions everyone can take to stay on top of clutter and keep even the most unruly of spaces in apple-pie order. Using containers to categorize items is one easy way to establish a degree of orderliness to all areas of your kitchen and pantry. Containers help organize because they group items and help combat the sprawl that tends to happen behind closed doors – and drawers. By confining items to one place, they make clean-up less of a chore because that container can quickly be removed and washed under. Also, with proper labeling, containerizing can prevent ingredients and items from getting misplaced. The counter-top canister, like the one pictured above, is an obvious illustration of the practical use of containers for organizing. It has been keeping kitchen counters neat for generations by grouping frequently used utensils together and keeping them handy for everyday tasks. Here are three qualities to look for when deciding on the perfect container for the job. Durability. A flimsy basket just isn’t going to cut it for containing your pot lids. A container should be sturdy enough to hold up to repeated use. Size. Don’t choose something that is too small for the amount of items you intend for it to house. Charm. Choose containers that you actually like. They may have sentimental value or add aesthetics to your kitchen. It doesn’t matter if they match or not, but you should love them! When choosing containers, start by working with what you have before you go out and purchase what you need. For example, a large Christmas cookie tin that sits unused for most of the year can house cookie cutters or baking ingredients from January to November. Think outside the box–literally–when scouting for a container. 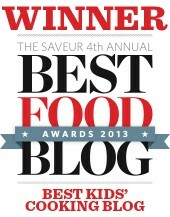 It’s doesn’t have to say Rubbermaid or Tupperware (although those are wonderful choices) to serve it’s purpose. Glass, metal, plastic, wooden or cardboard containers can be square, round, rectangular or freeform and all can find their niche in your kitchen. 1. Tins ~ Large or small, square or round, tins are ideal for containing small, easily scattered items like magnets, rubber bands or dried yeast packages or even bulkier things such as cookie cutters. 2. 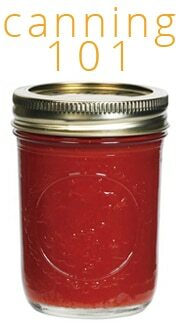 Jars ~ Foods bought in bulk can be transferred to jars for airtight storage and is ideal for showcasing it’s contents. 3. Upright Folders ~ A kitchen generates nearly as much paper clutter as an office. Keep an upright file folder around for housing recipe clippings, shopping lists and other important papers. 4. Baking Tins ~ The antique loaf pan in the photo above holds some of my smaller cake decorating supplies. It does a fine job of preventing them from getting strewn about the cupboard, and they are still easily accessible. 5. 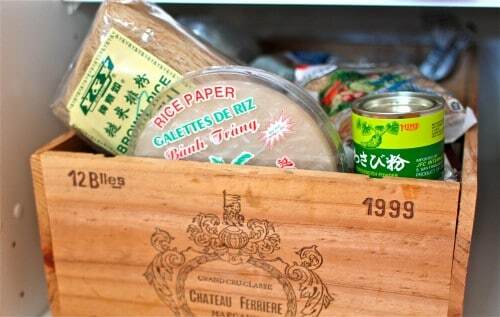 Wine Boxes ~ I have a few wooden wine boxes that house various items in my kitchen cupboards. This one groups Asian ingredient together and another holds folded dishtowels and rags. Drawer space is always prime real estate in my kitchen, but using wine boxes as open drawer storage frees the drawers up for other items such as utensils or cutlery. 6. 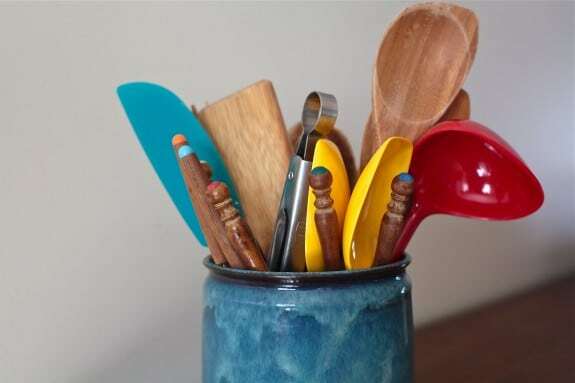 Jugs & Canisters ~ Stash away wooden spoons, plastic cutlery or those pesky fondue forks that you never use. 7. Can Rack ~ A worthwhile investment if you bulk up on canned goods, a heavy wire soup can rack holds most sizes of cans and is a lot safe than stacking cans three high as I have done in the past! 8. Pot Lid Rack ~ From the Ikea Rationell Variera kitchen organizing series, this nifty wire rack houses my pot lids neatly as opposed to strewn around my cupboard. 9. Baskets ~ Wire, wicker or any other variety, baskets can have many uses in a kitchen from housing bags of spices to folded cloth napkins. I coil my laptop power cable in a small basket on the kitchen counter and stash other small electronics in it as well. Baskets are ideal choices for kitchens with open storage or for grouping dried foods on pantry shelves. 10. Plastic Bag Dispenser ~ This $1.99 investment from Ikea mounts inside a cabinet or pantry door and keeps those billowing plastic bags in check. A classic example of how a container helps organize. 11. 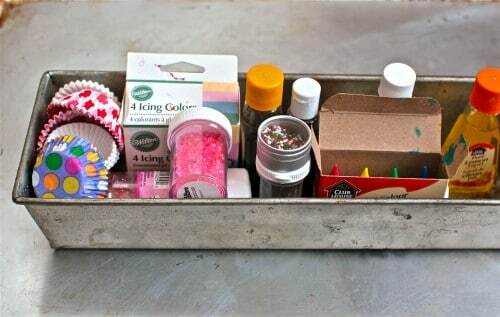 Cutlery Tray ~ Not just for cutlery anymore, pick up an extra tray for your ‘junk drawer’ and sort those tacks, pens, twist-ties, clothes pins and AA batteries. 12. 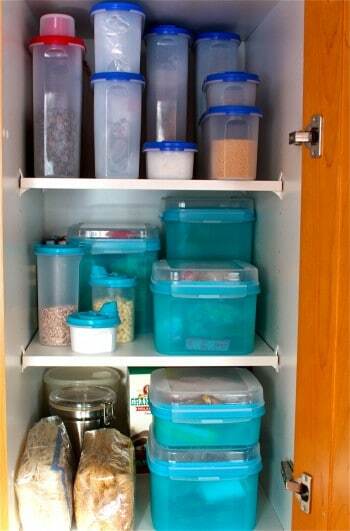 Tupperware ~ Any shape, size or color, there’s no question Tupperware rules when it comes to pantry storage solutions. Their airtight Modular Mates (top shelf) hold my baking supplies, while the blue containers below keep small, bagged items such as nuts and grains in check. 13. Pails ~ Tin, plastic, or otherwise, pails can holding cleaning supplies, plant or pet food and even stand in as the household tool box if need be. 14. Rubbermaid Bins ~ 101 uses? Perhaps. My 6 Qt clear tubs hold camping supplies, picnic utensils and keep the children’s arts and crafts accessories organized. Ready to get started? I challenge you to address the most disorganized area of your kitchen and see if some sorting and ‘containerizing’ doesn’t bring a degree of order. Have fun! Could your kitchen benefit from some organization? What area do you find challenging to keep orderly? My kitchen could definitely benefit from more organization. I am a pretty relaxed (read type B) homemaker, so I always need to revamp my cleaning and organizing in the kitchen. I use 1/2 gallon jars for food storage, but I will try some other containing tactics. 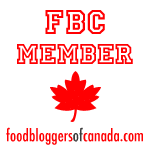 .-= Shannon’s last blog: Soaked Oatmeal Porridge =-. Those 1/2 gallon jars are handy, Shannon, and not easy to find anymore. 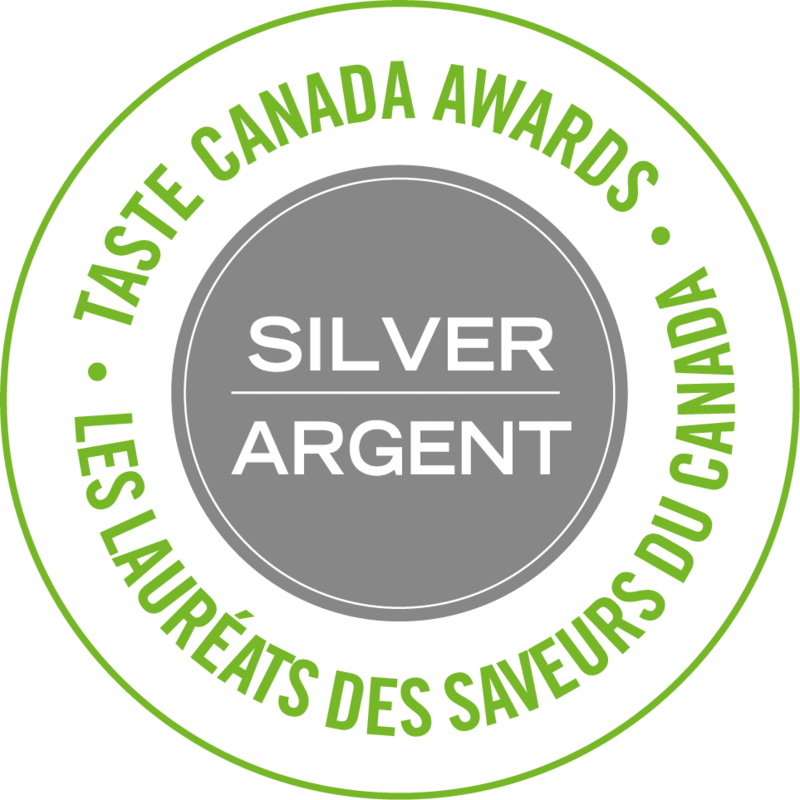 Do you buy them in bulk for your home canning? I think you’ve hit on all the containers out there. My favorites are classic Tupperware and wicker baskets. I love that you can use the baskets anywhere and they can look like part of your decor if you choose. .-= Tina @ Ride On Toys’s last blog: Childrens Ride on Toys Help Kids Reach Important Developmental Milestones =-. My basket collection is multiplying, Tina. I love serving food in baskets, too, especially over the summer, when we’re eating outdoors. I think there is one container type that you might have missed: ziplocs! I use these for everything from airtight storage of sugar and flour (to keep out any nasty wee beasties) to keeping my recipe pages clean while I cook. We’re in the midst of a kitchen remodel, and just started loading things back into cabinets. You hit the nail on the head with the pot lid storage. I’m keeping all my pots and a few appliances in my shiny new corner cabinet with “super Susan”, and one thing that transplanted incredibly easy from my old particle board cabinets to the new painted maple ones was the sturdy fabric and wire basket I had purchased to hold all my pot lids. It actually fit perfectly within the Susan, and this made me very happy indeed. I no longer need the bigger matching basket I used as a sort of drawer in the old cabinets to hold all the pots, but I’m sure I’ll find a new use for it, maybe in the new pantry. Nothing like completely gutting your kitchen and starting over to make you appreciate a post like this. I’m about to go into organization overdrive because I don’t want the shiny new gem of my home to be messy in any way! .-= Amber’s last blog: Wordless.. Monday? =-. Wo-hoo! A new pantry to stock and a new kitchen! Sounds like you’ve got the perfect incentive to get organized, Amber. Happy cooking. 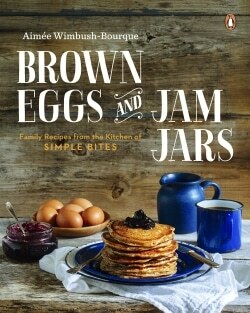 I also enjoy using glass jars that I pick up here and there or that have previously housed jam or some other condiment. I have them all in my pantry labeled with just tape and marker to hold all of the bulk items I buys from our coop like wheat germ, sunflower seeds, etc. We also got some wire drawers that installed in the bottom of one of our cabinets that I use to house all of my plastic containers. While they are not organized in the drawers at least I can pull the drawers out to view them all (none getting lost in the back of a cabinet!) and they are contained within the drawers. I love them. Great tip about the wire drawers, Rachel. It’s always a challenge to keep my tupperware/plastic containers in check. I have a ceramic water jug shaped like a lemon. I keep all my spatulas, whisks, wooden spoons, etc. in it, and I love it. It makes me happy every time I look at it! That’s perfect, Paula. I have a blue pottery jug that I brought from my hometown; it houses a few items, but mostly makes me happy when I look at it too! I didnt want to spend the money on a plastic bag dispenser and I don’t remember where I got the idea (on the internet im sure) but I now use an old baby wipes box! I took a huggies box and cut off the rubber part of the opening to make the hole bigger. I had a hard time fitting a lot in until I got the ingenius idea from Mandi at Organzing Your Way on how to make them more compact. Oh, that Mandi! Smart as a whip. =) Love her. I use an old sock (clean) with a small hole in the toe. Rather than throw it away, I stuff bags into the top and pull them out through the hole in the toe. A small snip near the top and there is a handy way to hang it on a hook inside a cupboard door. Someday I hope to have the time to knit something more decorative but for now the sock is a great repurposed way to organize all those bags! I wouldn’t be able to live without my pot rack. My husband made me an amazing one out of left over hardwood flooring from a recent reno project. I hang 2 pots, three frying pans (one is my 12inch cast iron) along with a set of stainless steel bowls. It is wonderful not to have to bend down and rummage in a cupboard. I have the same pot lid rack mentioned in the article, but have hung it next to the stove. It is amazingly handy and looks neat and tidy. Sounds like a pretty handy hubby there, Michelle. Tell me, how do you hang the stainless bowls?? I was given a set of these as a birthday gift. I use an Ikea stainless steel colander for my spoons, wisks, spatulas, etc.. I got the idea from my daughter. Holds a lot, cost a little, is very stable, and looks great! That is the best kind of container, Linda. Mason jars for dried goods seems to be a popular one (and looks great), but the one that has really changed things in our kitchen are the little (4oz?) Bernardin plastic capped jars (buy at Canadian Tire) for spices/dried herbs. Stackable, space efficient, and because I can see them and they are organized, I find that I’m a lot more likely to use them, and as a result, to experiment with spices. Perfect. Thanks for sharing Ian. Sounds much more practical than little bags of spices that never do close properly. -Old soda can box (the long “Fridge Pack” kind” under the sink for holding plastic bags, which I fold lengthwise into quarters and then like a flag, into a neat little triangle. This saves so much space, if you don’t mind taking the time to fold your bags. They don’t get all tangled up together this way. -We are on the WIC program, and end up buying a lot of tuna in the packets (rather than canned). At the store on day, I realized that the cardboard boxes used to hold the packets in the store shelf would work equally well on my pantry shelf, so since I was buying all the tuna in that container anyway, I just grabbed the box and asked if I could keep it. This could apply to other supermarket items as well, I’m sure. I believe these boxes just get thrown away anyway, so it doesn’t hurt to ask to keep them! Great article! I once bought a cleaning supply kit that came in a mid-sized (somewhat flimsy) white plastic basket. I cleaned out the basket and now use it as a holding pen for all my measuring cups, measuring spoons, funnels, etc. So easy when I’m cooking to just set the basket on the counter and I have everything I need at my fingertips! I really need to conquer the pantry. The idea of using a large tuperware to corral all those small bagged items is great! There’s nothing worse than discovering you’ve wasted half a bag of pecans simply by losing track of it, and now it’s full of ICKY bugs!! I have a fairly shallow pantry and have a lot of jars and cans, which crowd each other dangerously on the very rectangular shelves (I had a jar of sauce get pushed off the edge while I was trying to put away another can!). Does anyone have ideas on how to organize ROUND jars in a RECTANGULAR pantry? Or a better place to put them? My pantry shelves are wide enough for a lazy Susan for round items and square ones. I hope that helps. Yeah.. I am pretty much the worst at kitchen organization. But, my kitchen is decades old and isn’t the best suited for my needs. We are getting a new Ikea kitchen soon, so I’m going to take these ideas and run with them! 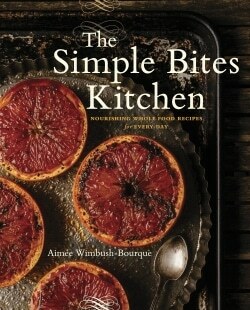 .-= Amanda G.’s last blog: Digital Tools For a Simpler Life =-. Mason jars and wicker baskets are my go-to items for kitchen storage, but I must say I LOVE the idea of using an antique loaf pan for corralling small baking items. I spend much of the spring at antique markets (and thrift stores) and will now be on the hunt for a few of those myself. .-= Jan (Family Bites)’s last blog: Open-Faced Curried Chicken Sandwich =-. Oh, the neat kitchen. Almost the bane of my existence. If Hubby ever cooked I think it would kill our marriage. His version of organized and mine are very different! One thing that has totally helped me, particularly because I bake with my kids a lot, has been creating a dedicated baking zone. All my ingredients, utensils, and pans are in one spot. What a difference! 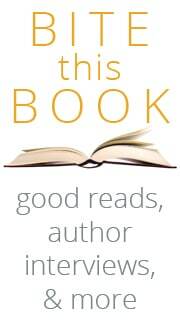 .-= Cheryl Arkison’s last blog: Things That Make Me Tired and Happy =-. Thank-you, thank-you… I love you forever . I never buy containers because I know I have them lying around our house I just need to look more carefully or more creatively… And there they are: bread pans!!! I haven’t used ours since we bought a bread machine… brilliant idea!!! My favorites are the dollar-store-variety shallow bins. They are 2, 3, or 4 inches wide and come in varying lengths, and so can be custom fitted to fill almost any drawer size. They do a fantastic job of keeping all untensils sorted and still visible. 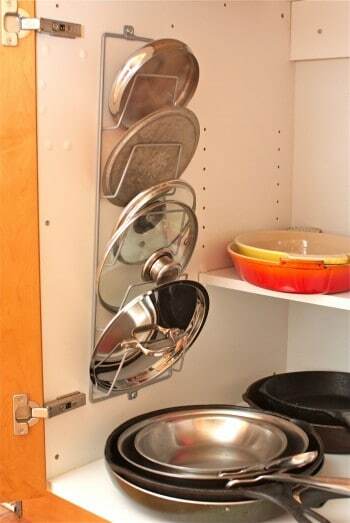 I am looking for the pot lid holder/ magazine rack. I looked on Ikea website with no avail. Anyone seen these anywhere else? Everyone thinks that organizing their kitchen is a tough task and many people are intimidated just by the thought of it. Using plastic bins and containers makes this process really easy. Just find some nice, reliable, colored bins and start de-cluttering. Not only is it easy, it’s actually fun and you’ll feel like a weight has been lifted off of your shoulders once you’re organized! with a lot of facilities which range from employment to commercial paint contractors. a result of sunshine, humidity or heat. up is written by him as no one else recognise such specified approximately my difficulty.